Hillary Clinton's nonexistent hawk problem. Bird of a mainstream Democrat feather. Jeffrey Goldberg’s interview with Hillary Clinton got deep into the weeds of foreign policy, teasing out the former secretary of state’s contemporary and current thinking about Obama administration moves in the Middle East. As far as the news cycle is concerned, the lede is that Clinton said ” ‘don’t do stupid stuff’ is not an organizing principle,” and David Axelrod tweeted about this. It’s 2008 all over again! There wasn’t all that much daylight between Clinton and Obama—she defined “stupid stuff” as doing what “we did in Iraq and to have no plan about what to do after we did it”—but enough of a disagreement that the two leaders will reportedly “hug it out.” Those looking for more disagreement between Clinton and her likely Democratic primary electorate are focusing on other parts of the interview. To Goldberg, she reiterates that she thought, in 2012, “that if we were to carefully vet, train, and equip early on a core group of the developing Free Syrian Army, we would, number one, have some better insight into what was going on on the ground,” and “two, we would have been helped in standing up a credible political opposition.” Noam Scheiber reads this and thinks that Clinton blew it. [O]pposition among Democrats to overseas interventions, particularly in the Middle East, remains so strong and raw that, if Clinton continues in this vein, even a weaker insurgent candidate than Warren could theoretically rough up Clinton in a primary (although probably not defeat her outright). That’s particularly so when you consider that Obama remains very popular within the Democratic Party. It’s bad enough to announce your support for a more hawkish foreign policy. It’s much worse to marry it with a shot at the president. Let’s proceed on the assumption that the “shot at the president” was fairly mild. 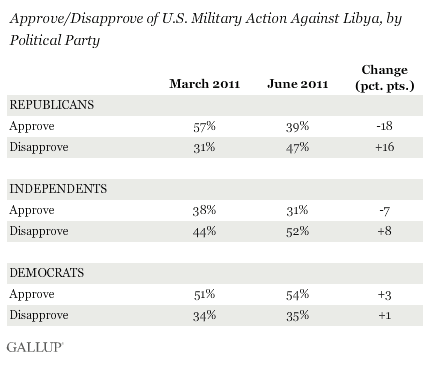 The evidence that Scheiber cites for the claim that that Democrats oppose “overseas interventions” is recent polling on the Iraq war. That was a land war of choice begun by a Republican president and supported initially by Hillary Clinton. (She has apologized in the pages of Hard Choices.) What about the actions supported by President Obama? In September 2013, when the White House was attempting to build support for missile strikes in Syria, Democrats were the political group most likely to support them. 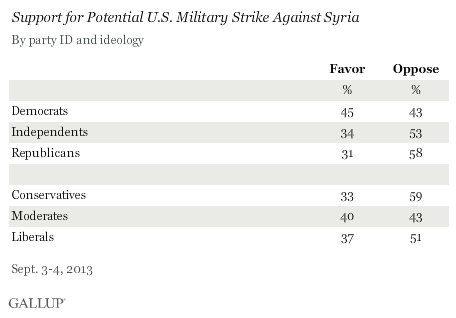 Keep in mind: In May 2013, before the White House supported the strikes, Democrats were the least likely to back them. When it became Obama’s mission, a Democratic mission, Democrats were foursquare behind it. And the same was true of the Libya intervention, which Clinton defends here. Here’s Gallup, from the summer of 2011: That last poll makes the dynamic pretty clear; but in case it isn’t, let’s look back to the 1990s. When Bill Clinton was president, Democrats were far more likely than Republicans to support military action—if Bill Clinton said it was necessary. Not sold yet? Consider that the mainstream left position on Iraq, from 2002 to 2008—from Al Gore to Howard Dean to Barack Obama—was that America needed to focus its might and money on the conflict in Afghanistan. And consider that Democrats voted for Barack Obama over Hillary Clinton after he came out for military actions in Pakistan with or without the approval of the country’s government, and she disagreed. The evidence, I think, is that the entire country is more skeptical of foreign intervention in the wake of the disastrous Iraq war, but that Democrats have remained generally supportive of foreign intervention if it’s backed by their president and directed toward a stated goal. Clinton’s stances on Iran negotiations and Israel are more problematic. But if you’re wondering whether there’s an anti-war movement ready to beat her, ask yourself when was the last time you saw a left-wing anti-war protest. Who was the president?